Yaaaaay, for Macy! I recently adopted a Pit Bull out of Alabama that was shot. She is the light of my life. I have never been around a dog that is so loving. Her name is Gracie and I am so lucky that we found each other. 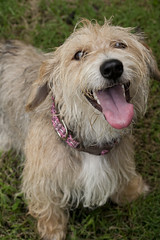 I will be purchasing some Martingale collars for her and am thrilled that the proceeds go towards dog rescues. Thank you to the creators of this website and doggie rescuers, I wish I could do more.